Sure, it's effective. Your blog and email newsletter have brought lots of new visitors to your website. Some of those visitors have even expressed an interest in buying your product or service – nice job! But the competition is out there, and it's growing every day. The Content Marketing Institute's 2016 study of B2B content marketing trends and benchmarks in North America shows that 88% of B2B marketers are now using content marketing. The study also indicates that over 50% of B2B marketers have either an "adolescent" or "mature" level of content marketing, meaning they've found success with their campaigns and are now working on more advanced ideas like content scaling and integration. Now that everyone is jumping on the bandwagon, it's more important than ever to stand out. Your marketing needs to cut through the noise. To truly reach your target audience, it needs to be authentic – a genuine expression of your brand, something that people can't get anywhere else. One of the best methods of developing authenticity in your marketing is podcasting. Sure, it's nice to have a blog where you can use a unique writing voice. Design and style guides help keep your branding consistent: I absolutely love the pink thing that Uberflip has going on. These elements certainly help you stand out. But it takes more than a lighter shade of red to win the hearts, minds and dollars of today's buyers. You need a channel that is totally your own. A platform upon which you can develop an intimate relationship with your target audience, one that goes beyond another email in their inbox or blog post for them to read. What's the one thing you have that no one else can duplicate? A totally genuine method of communication that you've been using instinctively since you were a toddler? Podcasting strips away all the fancy calls-to-action, the multivariate conversion testing, the lead nurturing automation sequences: it's just one person's voice, talking to someone else. What could be more authentic than that? I've never met Ed Gandia. We've never spoken on the phone; he lives several hundred miles and a few states away from me. But he's come with me on metro rides, long car trips, workouts, walks in the park, and so on. I'm even holding out hope that he'll make it to Thanksgiving this year (just kidding, Ed!). Why do I have this type of connection with a person who probably has no idea that I exist? Because I've been a regular listener of his podcast about B2B copywriting for about a year and a half now. When people listen to your podcast, they take you places where they don't take other forms of marketing. Does anyone read email newsletters while they are doing the dishes? Who is checking out a new white paper on the treadmill? Podcasting boldly goes where other forms of content marketing do not, which results in the development of a very authentic relationship with your target audience. In fact, sometimes podcasting can create a relationship that's too authentic. Just ask Sarah Koenig, host of the wildly popular Serial podcast. She's been called an "amiable doofus," a flawed journalist, and racially insensitive. "People feel like they know me, and they kind of do." Its popularity has forced the show's producers to send out polite-yet-firm requests for fellow journalists to stop speculating about the upcoming season so the show's crew can work in peace. This type of relationship might be harmful if you're an investigative journalist trying to cover a story, but for a B2B marketer, this level of intimacy does a great deal to help you establish authenticity with your target market. Forbes recently listed interactive content as one of the top trends that will emerge in the future of content marketing. We've seen marketers dip their toes into these waters already with tactics like contextual content and online quizzes. It's certainly nice to send out a poll to your email list, and a lively conversation in the comments section of your blog is a great thing to have. But where can your listeners actually hear you talking about their concerns? Where can they hear their own voice asking you a question or addressing a challenge they're facing in their industry? That's right – your podcast. In a truly authentic relationship, communication goes both ways. 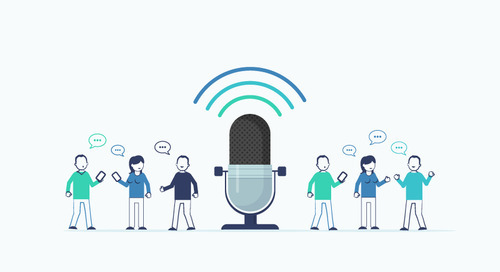 Podcasting provides a powerful avenue for interaction: Even if you aren't covering an unsolved homicide, the mere fact that your audience is invested enough to send in a question or have their own voice played on your podcast is a big win in B2B marketing. This input is hugely valuable for building a loyal audience that cares about what you publish, which is one of the most important steps of successful content marketing. 1. Be honest. Say what you feel. You don't want to fill your episodes with lengthy personal tirades, but you shouldn't be afraid to express your opinion when you hit record. Your audience is looking for a unique, fresh view on the issues they care about: Give the people what they want. 2. Use YOUR personality. That means you, the person, not your brand's voice. Sorry to break it to you, but no matter how many ping pong tables you have in your lounge or how cool your company t-shirts are, an individual person will always relate better to the voice of another individual. Let your own personality shine through. 3. Listen. It might sound weird to recommend this step for a marketing channel that involves so much talking. But if you aren't listening, your podcast is doomed. Listen to what your audience is telling you. Listen to what other podcasts are doing. Listen to the trends in the industry. Keep your ears open, act on what you hear, and you'll find your own authentic niche in the world of podcasting. "Be yourself — everyone else is taken"
As of 2015, 1 out of every 3 Americans over the age of 12 has listened to a podcast. Don’t squander this tremendous opportunity to build a relationship with your target market. If you can create value for your listeners and convey your unique voice, your podcast will build an authentic connection to your ideal customers. We're starting a podcast and we want your feedback! Fill out our short podcast questionnaire.